Diamonds are a girls best friend! This is an ABSOLUTELY STUNNING timepiece by Ulysse Nardin. 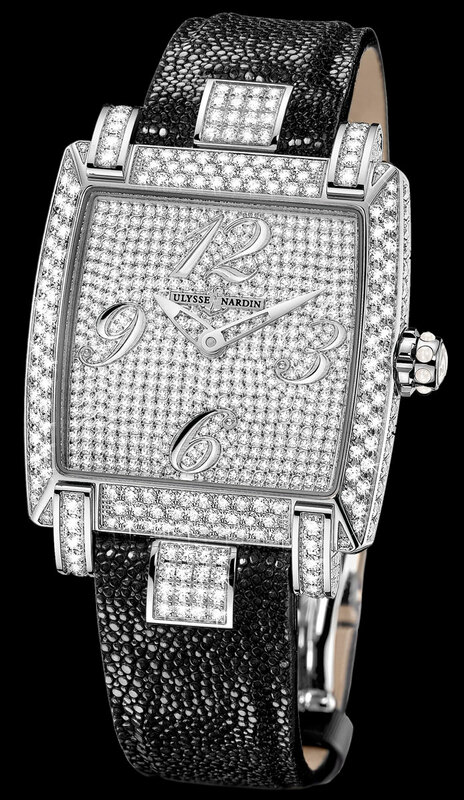 Over 700 of the worlds finest diamonds are hand set by Ulysse Nardins Master Watchmakers on this ABSOLUTELY STUNING LADY CAPRICE. It is an 18K white gold case,with a full diamond pave dial,bezel,and diamond case,automatic movement,the sapphire glass exhibition case back reveals the 22 carat white gold rotor set with 20 diamonds,it is available on a black stingray leather strap,and 18K white gold folding buckle. Available only by request. Price $63,000.00 dlrs. CLICK ON IMAGE FOR A SPECTACULAR VIEW!